With tall parents it wasn’t going to be long before Ethan outgrew his cot, so with his second birthday looming (on Christmas Day!) we decided to try moving him from his cot to a bed. My sister very kindly passed on my nephew’s first proper bed, which has the advantage of being in three sections. Opened out fully it’s the length of a single bed, but you can fold up one or both the ends to leave a smaller bedspace with padded head and foot boards, making it a less scary transition. Ethan also likes playing cars on the headboard and before he goes to sleep insists that his current favourite items are placed there (usually his fire engine, a book on fire engines and his cuddly bunny rabbit). After a quick rearrangement of Ethan’s room, which mostly involved clearing out my husband’s stuff that he’d stashed in there back in the days when it was an office/spare room, we managed to put up the new bed while still having his cot there as back up. Which turned out to a good move, as Ethan was so excited about his big bed he couldn’t sleep until we popped him back into his cot where he promptly passed out. Virus over and it was back to the big bed transfer mission. The next stage was transitioning out of the sleeping bag and under a duvet. Easier said than done when your little one likes to rotate from back to front and ends up sideways in bed most nights. With the help of some duvet clips we’ve managed to keep most of the duvet covering him. Other parents tell me he will learn to pull it back up himself – and hopefully stop kicking it off in the first place! Our other essential piece of kit was a bed rail, which has a mesh side that Ethan seems to enjoy nuzzling up to. It is also long enough that his escape route out of bed is quite narrow and he hasn’t yet, decided to get up and roam in the middle of the night. Instead he employs the tactic of shouting for Mummy and declaring he is stuck. Friends have recommended fitting a baby gate to his bedroom door so that if he does get up in the night he won’t get far. The other top tip we’ve been given is for once we remove the bed rail; we get Ethan to practise falling out of bed and getting back in again, with a carefully placed spare mattress next to his bed for him to fall out on. This is so if he does fall out in the middle of the night, it won’t be a scary new situation and he’ll simply climb back in. Let’s hope it works! 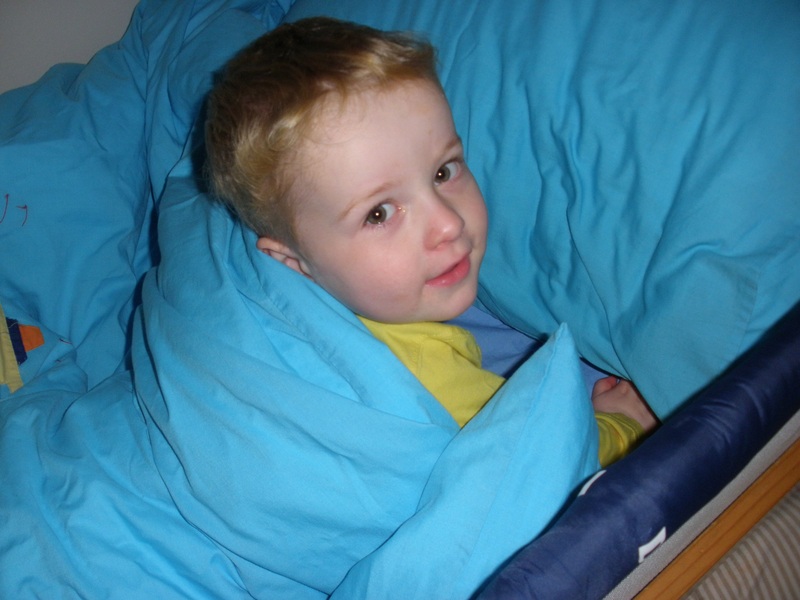 Ethan in his new bed! ← Did you receive one of these last Friday?